The next day, full of anticipation, but tinged with doubt, we headed for the beach. Parking along Highway 1, above Long Gulch, I decided a little cliff-top exploration would be wise, as the tide wouldn’t ebb to its lowest point for several hours. Besides, if there was a tunnel in the cliff-side that the military had used as an observation post, they certainly hadn’t required the observers to rappel up and down the cliff for entrance and egress to their post. Stumbling through the pathless, waist-deep scrub that covered the cliff-top, I was able to approach the edge of the cliff, above where I judged the hole I had seen on the CCRP photo should be. I saw no evidence of an overgrown entrance or anything else for that matter. There certainly was no sign any Intrepid Traveler had ever come this way. 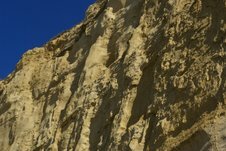 A ten- foot drop to a sloping, very unstable-looking ledge below prevented me from peering over to see if the tunnel opening was in the sheer cliff face just beneath me. Actually, it was the fact I didn’t want to make my only sight of the tunnel opening a brief one– as I hurtled by it on the way to the beach, nearly 100 feet below –that made me decide to try another path for my first view of it. Returning to the highway, we found the little used path through Long Gulch, to the beach below. It was a gentle descent for most of the way and only got steep the last 40 feet. Even there the support pipes for the giant plastic drainage pipe that transported rainwater from the eastern side of Highway 1 to the beach provided excellent handholds. The flat-bottomed, sand-filled canyon below it was quite nice. Protected by the canyon’s walls from all but westerly winds, and hidden from the highway above, it would be a nice clothes-free sunbathing-hideaway for those so inclined. Coming out of the canyon mouth, we turned north and hiked along the narrow strip of sand the waves weren’t playing on, the towering cliffs with their loose rock looming above. Oh No! A 100 yards ahead a small rockfall, visible on the 2005 picture, had grown immensely and was projecting far into the surf and blocking our way. Approaching the huge pile, it was obvious that it was quite recent by the amount of soil still mixed with its giant rocks, many of which looked ready to start rolling the rest of the way into the surf. Hopefully not with us embedded in them. Meg offered to be the Official 911 Notifier/Eulogizer, and I clambered over this last obstacle, eager for my first sight of…a sheer cliff. No tunnel, no hole, no story. There wasn’t even a deep indentation. I had been fooled by a shadow. I was feeling fool was the operative word about then. 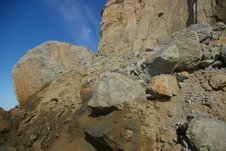 I took a panoramic sequence of photos of the cliff face for later analysis; clambered to the top of the rockfall and took a few more shots; then climbed down with the bad news. I delivered that with a joking reference to Geraldo Rivera’s infamous hour long special on the “Mystery of Al Capone’s Vault.” But, at least he opened an empty vault; I had found nothing, except disappointment. 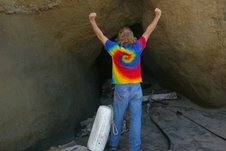 I then suggested we pick up our consolation prize and try to get some photos of the cave with the possible Zane Kesey’s initials. That’s better then nothing or even an empty vault, if it’s not another will o’wisp. So off we went. 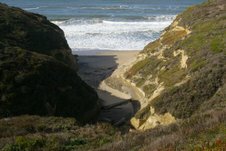 We weren’t sure exactly where it was, but knew its photos were near the end of a long sequence that had started at San Gregorio Beach and continued as we had headed south.